A long time ago (1977) in a galaxy far, far away (20th Century Fox) there was a film released called “Star Wars Episode IV: A New Hope.” George Lucas introduced the world to his Flash Gordon-inspired space opera featuring a plucky Rebel Alliance of freedom fighters battling the oppressive regime of the Galactic Empire. The rest, as they say, is history. The tales of intergalactic derring-do captured the public’s imagination and “Star Wars” became an entertainment juggernaut with an indelible impact on popular culture. Characters like Luke Skywalker and Darth Vader became household names and phrases like, “May the Force be with You,” became part of the American lexicon. However, it was shortly after the genesis of the grandiose sci-fi epic in 1977 that the nascent franchise would commit one of its biggest blunders. Of course, I’m referring to 1978’s infamous “Star Wars Holiday Special.” In the words of Randal Black, founder of Fargo Grindflix and connoisseur of cinematic trash, “I make no qualms about the fact that the ‘Star Wars Holiday Special’ is not even unintentionally funny, or good-bad. It’s just bad. It’s like an endurance test more than a piece of entertainment.” And it’s an endurance test that he plans on submitting audiences to at the Fargo Theatre, for the noble cause of collecting money and toys for Fargo-Moorhead Toys for Tots. From the get-go, however, it seems like “Holiday Special” was doomed to failure. Black regaled me with the origins of the ill-fated TV movie. Supposedly, in 1978 CBS pitched the idea to George Lucas of doing a TV special set in the “Star Wars” universe. 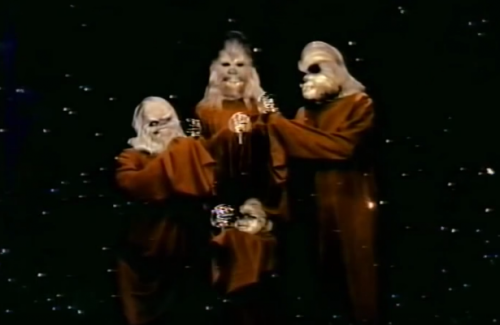 Although George Lucas hardly involved himself with the creation of the special, it was his idea to center the story around a family of Wookees and their celebration of a holiday called “Life Day”. “One of my favorite tales about the program is from famous comedian/writer Bruce Vilanch, who worked as a writer on the special. Supposedly Lucas was the one who pushed for no subtitles during the Wookees’ dialogue and Vilanch warned him that the show would turn into one long episode of ‘Lassie’, which-at times-is kind of what happens.” The original director even left the project over creative differences within days, which boded even more poorly. The film will not be the only thing going on that night. The doors will open at 6:30 PM and at 7:00 Comic Junction will sponsor “Star Wars” Trivia in the theatre hosted by none other than the sinister Emperor Palpatine himself. The special begins afterwards at 7:30. Admission is a minimum donation of $5 or a new toy as the screening is benefiting the Fargo-Moorhead Toys for Tots program. And of course, cosplay is encouraged. One of the organizations helping with the benefit is the local 501st Legion, a fan-based organization that dedicates themselves to constructing screen-accurate replicas of the franchise’s Stormtroopers, Clone Troopers, Sith Lords, and other assorted villains. So bring a donation, dress up as your favorite “Star Wars” characters, and may the Force be with you. From the sounds of it, you’re going to need it.